The three-time state champion kept her cool when it mattered most. When Bailey Plourde is playing her best golf, she’s among the top female players in Maine, regardless of age. This year at the high school state championships, the 17-year-old senior from Newcastle and Lincoln Academy showed she’s tough to beat even when struggling. Plourde, the defending girls’ champion, was pushing too many shots to the right through the first nine holes and found herself trailing longtime rival Erin Holmes of Greely. When Holmes birdied the 18th hole, Plourde stood over her own birdie putt knowing she needed to make it to post match Holmes at 1-over 73 and earn a share of her third state championship. “My approach wasn’t the best, but I had the confidence I could make the putt,” Plourde said. She rolled it in to forge the tie, ending her high school career with consecutive titles to go with the crown she won as a freshman. It also capped a season in which she was undefeated as Lincoln’s No. 1 player (9-0) and had a nine-hole stroke average of 37.4, and earned her a repeat selection as Maine Sunday Telegram Girls’ Golfer of the Year. Playing competitive golf at a high level is nothing new to Plourde, who started golfing when she was 5 and calls Samoset Resort her home course. 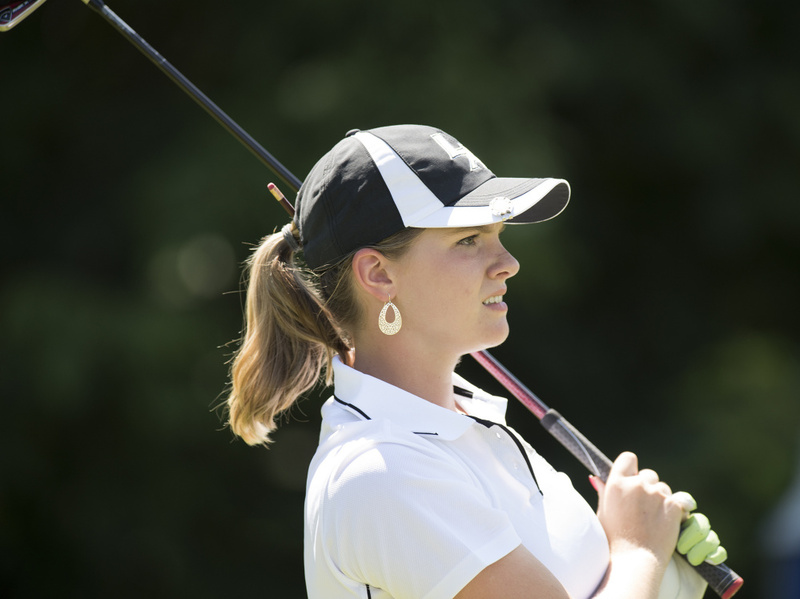 This summer, Plourde won the Maine Junior Championship at Val Halla Golf Course, then finished second in the Maine Women’s Amateur at Penobscot Valley Country Club. Plourde said she’s worked hard over her high school career to improve her short game, particularly her chipping from within 50 yards. Plourde is looking forward to playing in college, in part because she wants to experience being part of a women’s team and playing competitive golf around the country. She hasn’t made a decision yet but is looking seriously at Centre College in Danville, Kentucky, a Division III program that was nationally ranked in 2016. In Maine high school golf, there are no girls’ teams, meaning Plourde is usually matched up against a boy in the team events. Cole Anderson, Camden Hills sophomore: The 2015 Telegram Player of the Year, he won his second consecutive Class A title with a 1-over 73. Anthony Burnham, Scarborough sophomore: Burnham shot a team-low 76 to help the Red Storm place fourth in Class A, then tied for third in the Class A individual championship with a 75. Burnham was a first-team All-SMAA Northern Division pick. Eric Dugas, Maine Central Institute senior: Dugas won the Class B title by 4 strokes with a 1-over 73. His round of 74 was the best score during the Class B team competition. Reed Foehl, Portland junior: He placed sixth in the Class A individual championship with a 77 and was a first-team All-SMAA Northern Division choice. Erin Holmes, Greely senior: Holmes tied Bailey Plourde for the girls’ individual championship with a 73, making a birdie on the final hole. The state runner-up as a junior, Holmes helped Greely finish fifth in Class A.
Caleb Manuel, Mt. Ararat freshman: Manuel led the Eagles to a Class A runner-up finish with a 73, then backed that up with 3-over 75 to tie for third in the state individual championship. Bailey Plourde, Lincoln Academy senior: The Maine Sunday Telegram girls’ golfer of the year, she birdied the final hole to tie Erin Holmes of Greely for the girls’ championship. It was Plourde’s second straight and third overall; she finished second as a sophomore. Plourde also won the Maine Junior title this summer. Lucas Roop, Gorham junior: The Class A runner-up with a 74, Roop shot a 79 during the team championship to help the Rams nip Mt. Ararat in a tiebreaker for the Class A title. Lauren Schonewolf, Cape Elizabeth senior: She tied for fourth in the individual championship with a 78 and helped the Capers to a Class B runner-up finish with a 79. Logan Thompson, Mattanawcook Academy junior: The Maine Sunday Telegram boys’ golfer of the year won his third straight Class C title with a 5-under 67. The week before, he shot a 68 to lead the Lynx to a second straight team title. Thompson was the Maine Junior champion this summer and is a three-time all-state selection. Mark Bailey, Erskine Academy: Bailey’s team had four players shoot 80 or better to win the Class B title by eight strokes over defending champion Cape Elizabeth. It was Erskine’s first golf championship.